U.S. railroads already are among the safest in the world. But over the past several years, IBEW members have helped install technology across the country that aims to make them even safer. 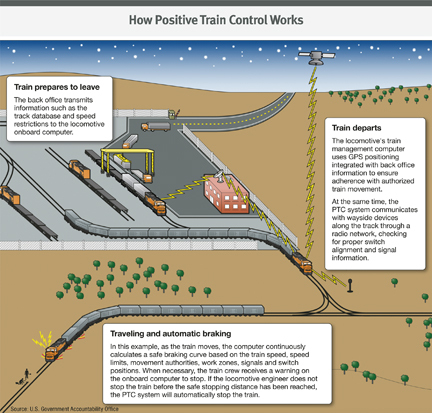 The system, called "positive train control," pairs wayside markers with sensors on a locomotive through a GPS system that further automates safety-related components like speed, braking and other warnings and signals. It can alert an engineer of potential problems or even slow or stop a train for safety reasons, greatly reducing the possibility of human error as the cause of a rail accident. "Members from our railroad branch and several other branches have been major players at every step of the PTC installation process," said International President Lonnie R. Stephenson. "We've brought to this project the know-how to handle the numerous systems and equipment to get the job done right." Various automatic train management systems had been proposed for decades. But Congress was spurred to take action following the Sept. 12, 2008, collision of a Metrolink commuter train with a Union Pacific freight train in Southern California that killed 25 people and sent more than 100 to hospitals. Just over a month later, President George W. Bush signed into law the Rail Safety Improvement Act, requiring 41 selected railroads, carrying passengers or hazardous cargo, to implement PTC to supplement existing safety systems. "Railroad branch members have long understood the dangers inherent in our line of work," said Railroad Department Director William Bohné. "Safety is one of the core values in our Code of Excellence, so doing our part to make railroads safer in this way is a natural fit for us." By coordinating trains' speed and movement data, PTC was intended to react faster than a human to detect problems, send alerts, and even take action. But there was one problem. "After the law was passed, PTC had to be built from the ground up," said Rick Reynoso, vice general chairman of Railroad System Council 2, which has jurisdiction over the union's members at 10 railroads primarily covering the western portion of the U.S. "For the first two to three years, we were waiting for technology that didn't exist yet, and it has constantly evolved with updates." This — along with the price tag — presented a number of challenges for everyone involved, Reynoso said. "Railroads are businesses, all about the bottom line," he said. "They didn't want to spend a penny on PTC, but they were spending all this money on it and feeling like they were not getting anything in return." Eventually, various federal agencies made available millions of dollars in grants to help defray some of the costs of inventing, installing and testing PTC's complex mix of computers, radios and trackside equipment. Because of the immensity of the PTC projects — along with the IBEW's insistence that any contractors used to supplement this workload must be union — other IBEW locals besides railroad locals have been called in to help. 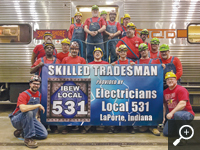 La Porte, Ind., Local 531 is an inside local whose members, helped by some fellow electricians from Gary and Hammond, Ind., Local 697, installed several of these PTC components for rail cars and trains running on the 90-mile South Shore Line connecting Chicago-area commuters with South Bend, Ind. "We were soldiers, doing whatever they needed us to do. It was quite an adventure," said Danny Ellis, a member of Local 531's executive board. "We worked five 10-hour days with an eight-day turnaround for most cars. [Management] told us, 'You do stellar work,' and that says a lot about our IBEW training." One of the biggest challenges with PTC installation has been interoperability. The trains of the "tenant" South Shore system, for example, need to move freely on, and communicate with, equipment used by its "host" railroad, the Chicago area's Metra commuter rail system. Similarly, Southern California's Metrolink is a tenant of host railroad Union Pacific. Following the California crash, National Transportation Safety Board investigators determined that Metrolink's engineer had failed to notice a signal requiring him to wait for Union Pacific's freight train to pass before entering a merge. Had it been installed at the time, PTC could have alerted the Metrolink engineer and, if necessary, stopped his train. Congress had expected PTC to be fully implemented by the end of 2015. But it quickly became obvious that most railroads would not be able to meet that deadline, so Congress extended it to the end of 2018, leaving open the possibility of final extensions to Dec. 31, 2020, provided railroads could prove that they qualified. Fortunately, the Federal Railroad Administration reported recently that by the end of 2018, PTC was operating on almost 46,000 of the nearly 58,000 required rail route miles — 83 percent of the required freight routes and nearly one-third of the required passenger routes. "Everybody on our end came through, from the system level to the local level," Reynoso said. "The IBEW's reputation for quality helped us get the work. We've knocked it out of the park so far, and our carriers have been happy with the result." And thanks in part to the work of IBEW members, four railroads now boast fully certified PTC operation: the Port Authority Trans-Hudson (PATH) connecting Manhattan and northern New Jersey, San Diego's North County Transit District, Oregon's Portland & Western Railroad and Metrolink. The remaining railroads successfully qualified for the 2020 extension deadline. Should they fail to meet it, they could face fines of nearly $28,000 a day. "With just under two years to go, I'm confident that our members will continue to work as efficiently and as safely as possible to get the job done," Bohné said. "Not only do we know that our employers and contractors are counting on us, we know that lives are depending on our success." 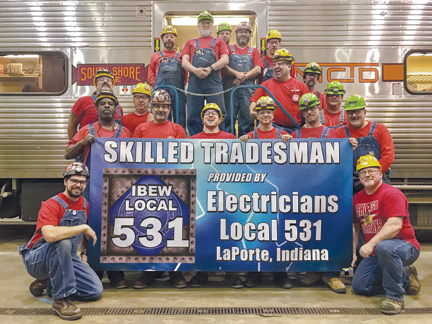 Members of La Porte, Ind., Local 531 were among thousands across the U.S. who have worked to install positive train control systems on tracks and in locomotives. 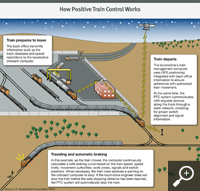 When active, PTC will nearly eliminate operator error and help prevent deadly rail accidents.